The search for the next generation of top culinary talent continues – as the prestigious UK Young Seafood Chef of the Year competition announces TV celebrity chef and two-time winner of BBC’S Great British Menu, Daniel Clifford will be joining the esteemed judging panel this year. 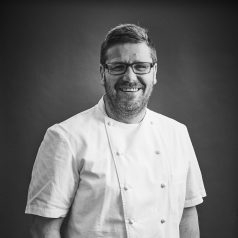 The highly respected chef patron of the two-Michelin starred restaurant Midsummer House in Cambridge, is widely regarded as one of the most inventive and gifted chefs of his generation. Daniel will soon be on TV screens as a judge on the current series of Great British Menu and has appeared on a number of cookery shows, including MasterChef The Professionals and Saturday Kitchen, as well as being a judge on Celebrity MasterChef Ireland. Highly regarded across the industry for the valuable experience it allows contestants to gain and for the calibre of judges it attracts, the competition, sponsored by Seafish, is a much anticipated date in the culinary competition calendar. Over the history of the competition, prominent chefs including Nathan Outlaw, Cyrus Todiwala, Aiden Byrne, Jean-Christophe Novelli and Tom Aitkens have all supported the contest. This year promises to be as exciting with the regional heats taking place across the UK throughout May. The contest is the only one of its kind open to full-time, college-based, modern apprentice chefs across the UK, who are under the age of 25. Now in its 17th year, it will see teams of two from colleges across the country competing for the much coveted title. Paul Robinson, Grimsby Institute, Curriculum Manager Hospitality said: “It’s great to have such a well-known name judging the competition. Daniel is a chef that the hospitality students will be familiar with.